On this date in 1941,* Stalin’s own brother-in-law was shot in the gulags. In 1906, a whole lifetime before, the Georgian Alexander Svanidze introduced young Joseph Dzhugashvili to his, Svanidze’s, sister, Kato. She and Dzhugashvili wed that year, and Kato soon bore her husband’s firstborn, Yakov. Stalin was already a wanted Bolshevik revolutionary at this time, but so was Svanidze. Kato was a homebody with no known political interest, and sufficient piety to force her communist groom to say his vows in an Orthodox church. Afterwards, his priorities reasserted themselves. While Stalin agitated, propagandized, and politicked against Menshevism in the wild oil boom city of Baku,** his pretty wife kept an empty apartment tidy and fretted the omnipresent danger of her husband’s arrest. “When he was involved, he forgot everything,” fellow-Bolshevik Mikheil Monoselidze remembered. Many revolutionaries’ wives walked similarly lonely roads. Kato did not have to walk hers very long: she contracted a horrible stomach/bowel disease and wasted rapidly away late in 1907. Stalin’s own indifference might have been the ultimate cause, for when she was unwell the young cadre took her on a sweltering 13-hour train ride back to Tiflis that greatly worsened her condition — all so that her family could care for her, and free Stalin’s time for his plots. Kato died in Stalin’s arms, but only when he had been urgently summoned back from Baku with word that her condition had become dire. Whatever his actions said about him as a family man, the future dictator really loved his neglected wife. He “was in such despair that his friends were worried about leaving him with his Mauser,” writes Simon Montefiore in Young Stalin. At the burial, Soso’s habitual control cracked. He threw himself into the grave with the coffin. The men had to haul him out. Kato was buried — but, just then, revolutionary konspiratsia disrupted family grief. Soso noticed some Okhrana agents sidling towards the funeral. He scarpered towards the back of the graveyard and vaulted over the fence, disappearing from his own wife’s funeral — an ironic comment on his marital negligence. Stalin’s deep grief did not change his life’s work. If anything, he would seem in later years almost too aghast by the whole experience (and his uncharacteristic bout of sentiment) to grapple with it. He abandoned little Yakov to the Svanidzes, and would curiously dislike his son so much that he eventually permitted Yakov to die as a German POW during World War II rather than exchange prisoners for his release. By the time of the great purges, then, being Stalin’s brother-in-law was of little help to Alexander Svanidze. 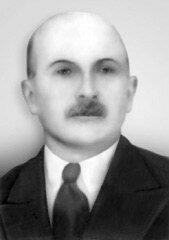 It might have been an outright detriment; certainly Svanidze’s own prominence — he had served as People’s Commissar for Finances of the Georgian SSR, and found a scholarly journal in his capacity as a historian — were of a kind with Old Bolsheviks who had also attracted denunciations. Svanidze’s son, Johnreed† — named for the American radical who chronicled the Bolshevik Revolution in Ten Days That Shook The World — denounced his doomed father to save his own skin, but was sent to the gulag just the same. Johnreed was released, and Alexander posthumously rehabilitated, after Stalin’s death in 1953. * There are some other dates out there for Svanidze’s execution. I’ve had difficulty identifying a primary source for any of them, but am prepared to be corrected if an alternative possibility can be strongly documented. ** They moved to Baku from Tiflis, where Stalin had helped to orchestrate a huge bank robbery. † Revolutionary Russia produced a number of similarly curious neologisms on birth certificates, such as “Vladlen” (blending “Vladimir Lenin”), and even the outlandish “Electralampochka” (“light bulb”, inspired by the Soviet electrification campaign).